We are a premium solution provider for the online sports betting and casino industry. Our sportsbook platform integrates data feeds from more than 40+ sports markets providing more than 3.200.000 bet lines daily and 870.000 bet markets to choose from. We constantly add new markets each month in order to provide the most complete coverage possible related to online sports betting. Our sports data feeds are provided with the platform at no additional cost. In play betting or live betting is the most attractive feature for any online sportsbook. Wagering while watching live events is the most popular form of betting. From a bettors point of view, the whole experience is very exciting and interactive making this service a very profitable feature for any online sportsbook. Our Sportsbook platform has the capability to host almost unlimited amounts of data while providing real time odds updates as well as data statistics like: goals, corners, faults, substitutions, yellow and red cards and much more, all this of course with 100% built in risk management. Using cloud computing technology provided by Amazon Web Services, our platform is capable of sustaining high amounts of data, activating local servers according to the location of the customers on the website thus providing ultra fast online gambling services. This allows customers to have a pleasant and fluid gambling experience regardless of how many players are actively on the website at any given time. Our platform is available by default in 12 languages : American English, British English, German, Greek, Finnish, Italian, Persian, Portuguese, Romanian, Russian, Spanish and Swedish. In addition, we can implement 20+ major currencies. If operators want to focus on a specific market, additional languages and currencies can be implemented by request. We are the only provider worldwide that offers true and complete UTF8 and RTL support enabling you to access the most exotic and demanding markets. Although our platform offers integration with a wide variety of online payment methods, operators can choose their own payment providers. Currently our sportsbook platform integrates the the following payment processing options: PaySafeCard, SafeCharge, WalPay, UseMyBank, MyCitadelWallet, Click2Pay, Moneybookers/Skrill, Ukash, QuickPay and Neteller. In addition to popular payment methods, we can implement the digital currency Bitcoin. More payment options can be implemented by request or through our APIs. In order to allow operators to gain insight regarding gambling activity on their sportsbook website, we have designed our sportsbook software with an advanced reporting system. 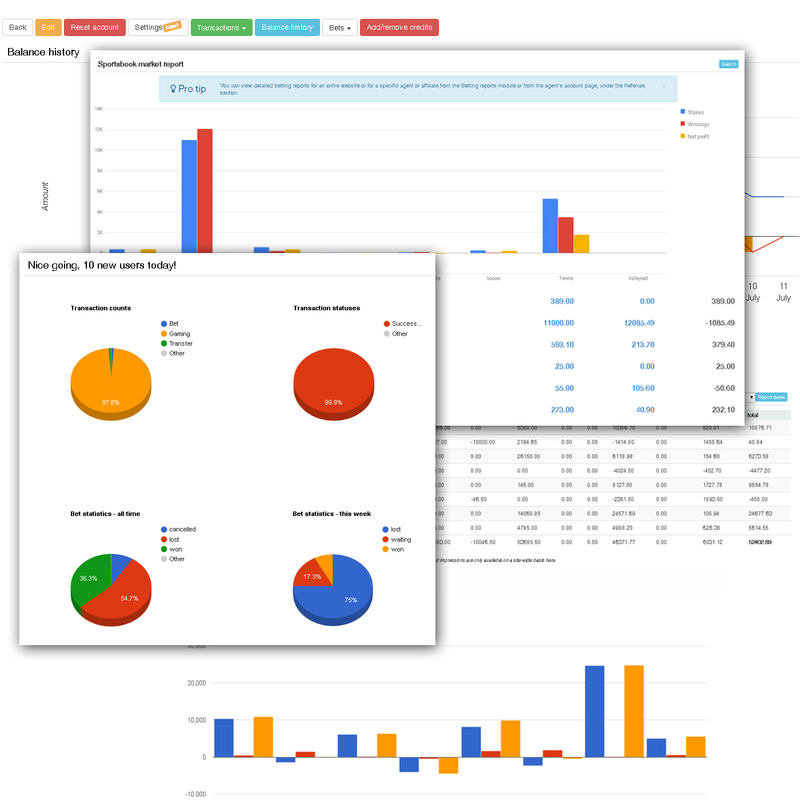 With just a simple click, operators get access to relevant data like: bets, visits, trends, transactions and many more. This data can be used for marketing purposes in order to increase the traffic and the activity on the website. A common feature shared by all the big brands in the online gambling industry is safety. As an operator you want to provide a safe betting environment for your customers. 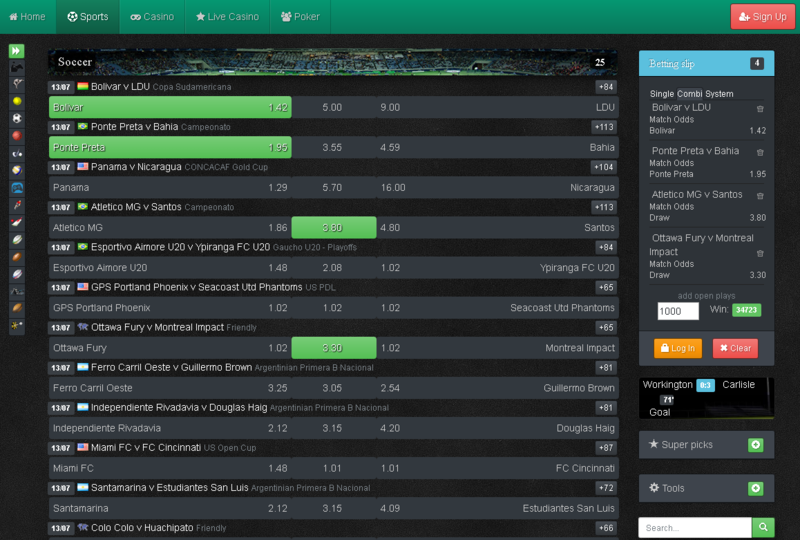 To do so, we have designed our sportsbook software with several tools in order to minimize risks. These modules will provide real time monitoring of all the activity on the website and alert the operator in case of anti-fraud, hacks or any kind of web attacks. We have been in the online gambling business for a long time and we have accumulated more than 10 years experience dealing with the online gambling industry. As our business partners, operators will have full access to all the information needed to start an online sportsbook from scratch and develop it into a multi-million dollar business. We provide excellent quality sportsbook software including supporting services such as hosting, data feeds, security, risk management, customer care and payment processing. We are an one-stop shop that enables access to one of the richest and most exclusive markets worldwide with minimal hassle. Our business hours are 9-6 GMT. © 2014-2019 sportsbooksoft.com, all rights reserved.